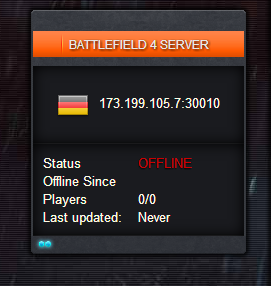 Hi i have add my bf4 server to the website , but website tell me that is OFFLINE but is not true ! I had also the same issue, but I got the answer already, so i'll share it with you. That's being said, your server has probably an firewall blocking their probe server from reaching your BF4 server. This is not really an bug, but opening an support ticket, will help you by getting answer to this faster. You pretty much described the problem exactly.